The disposability of the digital era is becoming ever more apparent, and a casual glance over the Internet tells you that most people aren’t too happy about it. Anyone with more than a passing interest in the music business will no doubt have seen the vinyl-championing ‘no-one remembers their first download’ meme that’s been doing the rounds of late, and the digital versus physical debate looks likely to rage ever fiercer. For Dimitri From Paris though, the problem isn’t the particular medium used, but rather the lack of care that is put into the finished product. Obsessed with the details of things, care and attention are cornerstones professional outlook and values that are demonstrated in his latest endeavour, ‘Dimitri From Paris Back In The House’. Here, we speak to the modern-day King of Disco about his views of role of format in music, his approach to the art for the remix and his enduring love of disco. What first got you interested in pursuing a career in music? I never really thought of making a career out of music, I was a music lover, I was buying a lot of records for my own enjoyment and I didn’t know how to actually interact with the music other than listening to it. Also I was going to a lot of concerts. One concert was a showcase of US hip hop that had all the early old school rappers, dancers, graffiti artists, MCs and also DJs spinning the records over which they would rap, and it’s the first time I saw someone do something creative with the record which was scratching the records rhythmically, looping sections, beat juggling between one deck to the other and I was totally impressed. That was kind of like an epiphany that you could interact with the music, you could do more than just listening to it. I remember going back home and trying to scratch on my turntable. It was pretty horrible, but that was the starting point of me wanting to interact with the music that I loved and from then on I started making edits, mix tapes, sending those out to radio stations and I realised that other people were interested in what I was doing, and it became my job gradually from there. What it is about disco that gets your blood pumping? The fact that it is live. It is done by a bunch of people and you get to feel the energy from those people. There are two distinct sides; a quiet raw side with a rhythm section (drums, percussion, bass, keyboards and maybe guitars) and then the classical orchestra; a group of really classically trained people, usually older than the rhythm section. The two sides getting together to play dance music is quite unique, and I feel the soul of all the people involved there. The most classic disco sound is the Philadelphia sound and that is exactly it; a group of younger people from the ghetto areas of town and another group of older people, slightly more educated, coming from different paths with a really long dedication in music behind them. They would get together and it would work, there would be someone in the middle directing all this, usually the arrangers or the producers, and they would make those guys play dance music which would end up being on a disco, and I believe it kept influencing dance music years on, even though today we do use computers. They infuse some kind of a groove, a way of doing things that is still replicated and emulated in a lot of different forms of current dance and house music, so for me it really is the blueprint and the mother of all things dance. Do you think that modern-day producers can really complete with the amount of time and money that used to be spent on creating music? It is true today that there isn’t as much production budget in music as there used to be decades ago, but it’s not necessarily bad. The point isn’t to try to recreate exactly what was done years ago; it’s great to be inspired by it and find new, more modern ways, of doing it, and not having a budget actually forces you to be more creative. In a way it can be positive as long as you’re not lazing out and making things really quick without much thought which sometimes you can hear in too much music today. But if you actually spend time, and you have a love for what you do, you will always be able to turn out something that’s good artistically. What has changed since you mixed your first ‘In The House’ compilation? What has changed is the economy of music, it’s been going down gradually for the past 15 years. Now everything is digital pretty much; people do not feel the urge to own something that’s physical as they are happy to have tons of music in their digital devices. Music has become the air you breathe, the water you drink; you don’t think that much about it anymore. It’s lost a lot of that value whereas before you would save money to buy a record and when you’d get the record you’ll just hold it in your hands and look at it while you listened to it. I feel that this has been almost completely lost, but I am still trying to give the people who want something to hold to, something to look at and something to read. It’s important that music keeps some kind of value, not necessarily monetary value, but effective value. I think it’s important to carry on with physical objects that actually enclose the music that we love. How long have you been collecting vinyl? Do you think it’s something you’ll ever stop doing? For about 30 years, and you have to remember that 30 years ago you could only buy music on vinyl, so it wasn’t a choice to be cool or not to be cool; I wanted music, I had to buy vinyl. Today you have the choice to buy vinyl and it’s kind of a niche market, as oppose to the whole digital thing. I do not buy vinyl if I can find it digitally, but I still buy CDs. If there’s something that I really like I will store it for archive purposes. Of course I’ve kept all my vinyl from the past 30 years, but even though there are still a few things that I’m looking for, like some older disco tracks. I’m not an obsessive vinyl collector, because I have so much, and so much more that I haven’t even explored that I feel like I should rather concentrate on what I have rather than just stacking up, obsessively, new things. So I don’t buy vinyl so much, but I still use my collection; everyday I will digitise something, everyday I will try to pull out something I haven’t used, so it’s a real asset to have all this music at your fingertips. It could be in any form though; it could be digital, it could be vinyl, as long as you contain it, as long as you take care of it. As a music professional, it’s the music that matters, not what it’s recorded on to. If you want to enjoy the music more on vinyl I totally understand that there is the need to hold on to something, so both are valid. I don’t like the debate, vinyl against digital, where one is better than the other. What really matters in the end is the music; if the music is good and you want to hear it then that’s all you need to do. You have quite a fastidious attention to detail, where do you think this comes from? I am very much of a detail person. I enjoy things that are not just one dimensional; you can go back at them and every time you look at them (or hear them if it’s a piece of music) you notice something new. So when I set up to create something – like this compilation – there is a piece of music, the packaging, the artwork; there are many things involved and it’s very important for me that in all those things everyone can find their tiny little thing that they prefer. The point is that you won’t spot them necessarily all at once. Every time you go back at it you might hear something new, you might see something you bypass, and it makes the whole thing more interesting. In the long run, details make everything richer and that’s why I love them so much. When I do a compilation it’s not a question of finding hits and putting them together so that one track would stand out more than the other, or people would relate to it or know it. I’m trying to get a musical programme that flows nicely from the beginning to the end, however, there are still a few things in there that, personally, stand out because they’re from producers or artists that I think have their own and unique sound. Among them is Poolside. It’s a duo from California, and they have that total Californian sound, almost surf and beach boy, to their music which is made with very strong elements of house music and I haven’t heard anyone mixing it so perfectly before. Also in there are a few older tracks; one of the records I like from the past that I think sounds super-fresh today is Murk’s ‘Pain’ under their Fury alias. I found it amazing that it sounds so current when the track is a good 20-years old. Also I very much like Storm Queen and Morgan Geist, I have two tracks from him on the compilation and the way it is produced, the vocals of Damian Scott, give it a very unique atmosphere and that is something that stands out for me. Finally there is a disco track in there that is very dear to me because I did this remix a few years ago. It was commissioned and I wanted to try to get a release of it and it was really hard to make it happen and finally with the help of everyone at Defected we made it and I’m really proud to have Dan Hartman featuring Aleita Holloway ‘Relight My Fire’ on the compilation because it has been a true labour of love to make it happen. It’s right at the end of mix CD2 and it’s kind of unmixed. If you’re a DJ out there wanting to play it, I made sure that you could. Every time I do a musical project it is also very important for me to have a hand in the designing and the packaging of it. It has to make sense with the music and also with my universe as a person and as an artist. So I always work with people that can build up off my ideas and in this particular case I worked with designer Juan Kelly, a true and very good disco DJ, but also a great graphic designer and on the photography side I was very happy to work with Jamie Baker who also worked on the first ‘In The House’ compilation. I came up with this idea that I wanted the whole project to look like a ‘60s American thing kind of inspired by the TV show Madmen, of which I’m a big fan. Since I never had the occasion to do such a design I felt it was a good thing with the ‘Back In The House’ to do the original ‘50s style. How has the transition from vinyl to CD to currently laptop been for you and how has this altered your sets? As a person I love vinyl, the object, something that I can hold on to, look at, read, listen to, but as a professional vinyl has been a tool, and this tool, to play music, has been superseded, first by CDs and now by digital files played off digital devices like laptops. I think this is progress in the sense that when I was only able to carry 80 to 100 vinyl in a record box, I can now have unlimited access to a huge music library and for me it’s much better the wider choices - the wider spread I have of music, the better for me. So it wasn’t difficult as a DJ, the only difficult thing was to digitise a lot of the vinyl or get copies that were clean enough to stand the test with the squeaky clean digital files. Once that was done I really enjoyed playing of CDs and I enjoy playing off digital software now because it actually allows me to do more and to be more creative than I was with just playing vinyl on two turntables. In the past you’ve done remixes for major labels… did you feel there was any pressure to deliver a certain style or were you always allowed to do your own thing? It looks like the major labels still act like they were doing 20 years ago by throwing like 20 things on the wall and trying to see which one sticks and concentrating on that. In the case of remixes I was always free to do what I wanted, they would use it or not but that was and still is the way they do things. Now, major labels can get like 10 to 20 remixes and instead of choosing the right remix for the right track they would just get everything they can and just throw it out there and see what happens. I think the best current example is Lana Del Ray; how many remixes have been done of her? I’ve totally lost count, it’s as if they’re not really interested in the result, just the quantity. You’ve re-edited some ‘classic’ tracks in the past by some very high profile artists. How do you approach these – do you look to respectively tweak the parts you like or go for an all out change? Every time I’ve set up to do a remix I think it’s essential that I don’t destroy the spirit or the memories the listeners have of a particular song, so I will be extremely cautious in remixing it, preserving all the elements and retaining the spirit. In the case of disco songs this means keeping all of the original recordings; not replaying the drums, not changing acoustic for electronic, everything I add I added in a way that you shouldn’t be able to notice it much, and that’s how I see remixing. I shouldn’t be taking the forefront, the forefront is the song. I should be on the background making it better than what it is, taking it to another area, like from a radio mix, taking it to the clubs with a more DJ-friendly mix. But I would never try to replace the original artist. I’m just the remixer, the producer, and I’m here to give my best to make the sound the best possible way in a direction that I’ve been asked to do it. The compilation has two CDs; one CD is a live recording that was done at the Horse & Groom where Defected hosted one of their regular Thursday night parties in London and I really wanted to try and capture what was happening in a small and cosy intimate space with also the sound of the crowd reacting to the music. I’m not happy with live recordings unless you can hear them in context and that means with the crowd that was there that particular day. The other mix is a more traditional studio mix. I also love studio mixes because it allows me to do much more tweaks to make it as detailed and as flawless as I can so that it is a continuous flow of music that you can enjoy and it doesn’t have the urgency or the bumps of the live thing, so they can be good for a few different situations. Where are some of your favourite places to DJ? What is it about them that appeals to you? The best place to play would be any place where the crowd is open-minded and is up for a party, where they don’t expect you to be following some kind of rule or some kind of style. That could happen anywhere but lately I’ve found going back to London I got the same vibe I was having there maybe 15, 20 years ago but with a completely new generation of people. I always liked in England how people would react to the music and how music would always be very important to most of them and I can still feel that the new generation has carried that on from the older ones and its very inspiring that in this day of age this still happens. Another place that I’ve always enjoyed playing at, I’ve been playing at for like twice a year for the past 15, 20 years, would be Tokyo and Japan in general where the people who go to clubs would have quite a different approach from the rest of the world; they would go to a club to see a DJ as they would go to a concert to see a band or an artist so they’re very focused on the artist and they usually have a very precise knowledge of the artist’s background. They really know all about you and react really cheerfully and very emotionally to the music, so it’s a blessing for a DJ to have such a captive crowd. 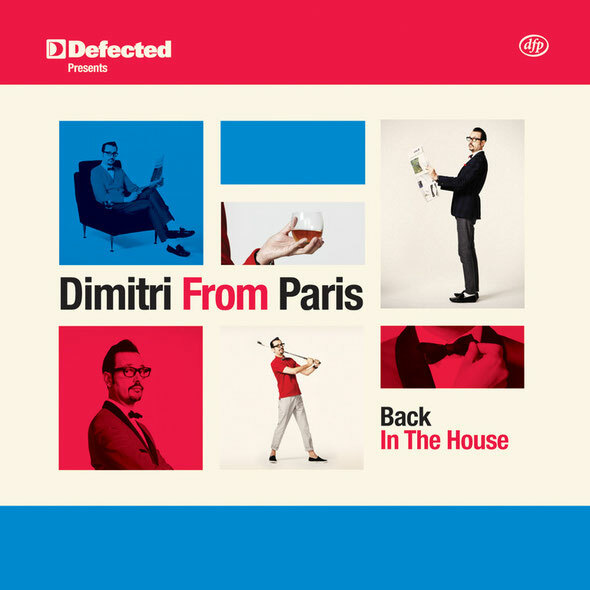 ‘Dimitri From Paris Back In The House’ is out 27th August on Defected Records.